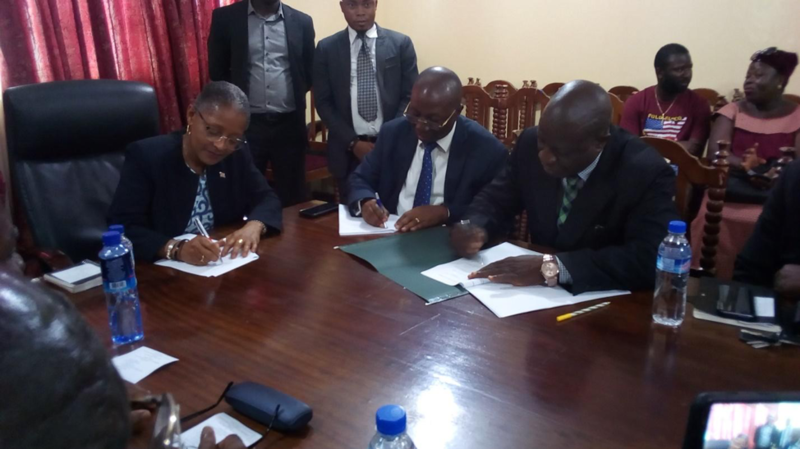 Monrovia – University of Liberia President Dr. Ophelia Inez Weeks has described the signing of a loan agreement between the University of Liberia Faculty Association and Ecobank Liberia as “a landmark move that will help address financial constraints faced by the administration. According to Dr. Weeks, UL will not continue with salary advancement for its staffs due to the huge task it is currently addressing, while naming the loan as a cover-up. Speaking Wednesday, during a signing ceremony of the loan agreement on Capitol Hill, she noted that the agreement reinforces lasting relationship already existing between UL and Ecobank. “Thanks for the cooperative attitude by University of Liberia Faculty Association to take responsibility on its own by engaging Ecobank Liberia for this initiative. This loan is important for faculty members and serves as a foundation of the lasting relationship between the two institutions,” Dr. Weeks said. The agreement was signed on Wednesday, March 20, 2019, between the University of Liberia and Ecobank Liberia. Under the agreement, Ecobank Liberia will extend loan facility to members of the University of Liberia Faculty Association (ULFA) who are full-time employees at the university. The agreement furthered that the loan package comes at a concessionary interest rate, with a one-month moratorium. During the event, Ecobank Liberia Managing Director George Mensah-Asante said the bank is interested in continuously finding innovative ways to promote its business and to also grow its customer base. “We are therefore extending our full array of financial service to the membership of the University of Liberia Faculty Association,” Mr. Mensah-Asante averred. “This loan includes a variety of digital products and services as well as other traditional banking facilities to the University of Liberia Faculty Association members,” he said. Mr. Mensah maintained that the loan agreement also provides the opportunity for applicants to apply for personal loan, vehicle loan, and mortgage depending on individual’s debt-service ratio. However, according to him, applicants must first be full-time employees of the University of Liberia, with no other loan obligations with other banks before becoming eligible for the loan. For his part, UL Faculty Association President Cllr. Viama J. Blama lauded Ecobank for making available such financial services, especially the loan packages to members of the association. Cllr. Blama named the loan as a tripartite agreement which aims at helping the faculty association improves its loan process at UL. He noted that the loan will be given on a 12 percent interest basis to only full-time employees at the University. Cllr. Blama said Faculty Association stands ready to take responsibility in the case of any situation that may arise during the loan process. “It is a tripartite agreement so, in the case of dismissal or death of any employee, UL Faculty Association takes the responsibility,” Cllr. Blama stated. Meanwhile, Cllr. Blama has pledged the Association commitment to endeavor in fulfilling all obligations associated with the loan, as a customer of Ecobank and to repay all loans contracted timely.